Taken from Sign Painters (Princeton Architectural Press, $24.95), featuring stories from American sign painters. Faythe: It's just a sign until it influences your entire life. My love for urban landscapes and signage predates my awareness of sign painters. I've always had a love for letters, and as I evolved as an artist in my early twenties my handwriting became an integral part of my artistic process. It was while I was living in Minneapolis in the late 1990s that sign painters entered my story. My group of friends spent time hanging out on the West Bank at a café called Hard Times. It was there that I first saw and took note of signs painted by a guy we called "Sign Painter Phil." Phil Vandervaart ended up influencing and mentoring this group of friends, all of whom I've maintained a friendship with over the years. Ira Coyne, Japhy Witte, Sean Barton, Sven Lynch, and Forrest Wozniak stuck with brush lettering and work as traditional sign painters around America (except Sven, who now runs his shop in Stockholm, Sweden). Phil's influence, first on my friends, and then trickling down to me, made a lasting impression. His work triggered an awareness, and I've never looked at signs the same way since. After wrapping up my last documentary and book, Handmade Nation, I kept thinking about the fact that there wasn't more information available on sign painters. It was surprising to me, considering the general interest most people have for the topic. It was then that I approached Sam, with whom I've collaborated professionally over the years, to see if he wanted to codirect a documentary on sign painters. I was confident that his extensive experience as a director, and our mutual interest in design and typography, would benefit the project. Sam: When Faythe approached me with the idea of making a documentary about sign painters I was intrigued, but I'd be lying if I said I knew what we were getting into. I've always been a visually minded person. Many of my earliest memories involve travel, much of which was by car. I'd stare out the window of the family station wagon and watch America transition from one place to the next. Even before I could read them, regionally specific signage denoted by color, shape, and design would indicate this passage. When we'd drive by an old painted barn sign demanding us to SEE ROCK CITY, I knew we were roughly halfway between Wisconsin and Florida. This basic awareness of signs grew and developed over the years, but it was not until we began this project that I learned what it was about good signs that draws me in. Faythe and Sam: So what makes a sign good? When we began this project we thought we knew. How wrong we were. We've learned that a great sign--a "perfect" sign, some would say--can be so simple that an average person wouldn't notice anything special about it, beyond the fact that it's telling you, "If you park here, you'll get towed." It's the expert sign painter's proficiency, talent, and ability that make a sign communicate effectively and keep you from the misery of the tow lot. This book, like the job of the sign painter, isn't always about eye-popping, flashy designs. It's about process. It's about communication. It's about the experiences, years of practice, tricks of the trade, and design fundamentals learned over time that transform a person who just wants to paint signs into a great sign painter. When we began this project people would always ask, "What's a sign painter?" Without knowing the half of it, we'd attempt to answer this seemingly simple question. The process has been enlightening, and we've learned a lot. Although we now may be more qualified to answer that question than we once were, these pages do a better job than we ever could. The following stories, ruminations, images, and thoughts, all from working sign painters, were collected over almost two years of filming. These incredibly talented individuals run the gamut in terms of age, focus, and experience; but whether they've been working for ten years or forty, we feel their varied stories provide a solid foundation to learn about what goes on behind the scenes. For the sign painters out there, we hope the contents of this book ring true and read like friendly shoptalk. 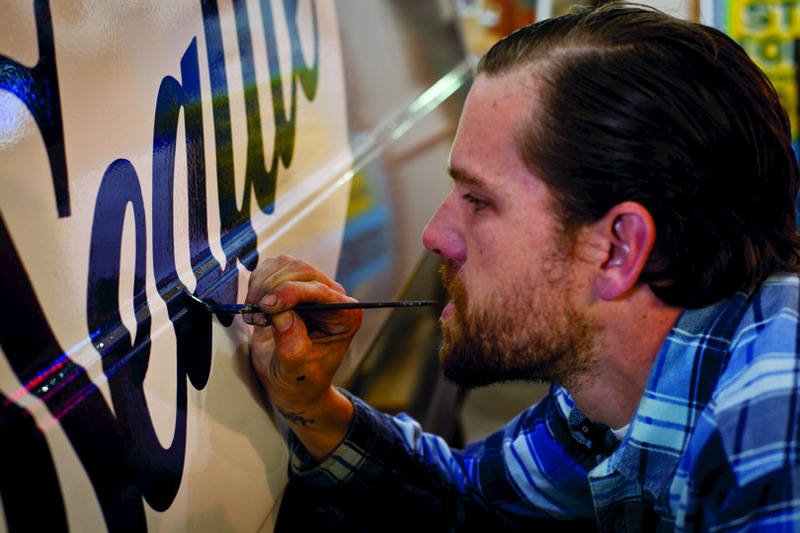 Our main goal with this book and film is to help show the general public how sign painters contribute to our society. Collecting these stories has been a humbling experience. It's time to give the sign painters the recognition they deserve. It's time to acknowledge their influence on our public space and consciousness.